Another meal that I had to come up with just because I had to work with what I had on hand (pantry, refrigerator and freezer) because neither I nor Marjo felt like going to the store. Previous day I bought beautiful cremini mushrooms that were on special so that was my base. What with? I remembered chicken tenders that I vacuum packed and froze last week and that was a good start. Side had to be pasta but I have so many kinds and shapes that choosing wasn’t all that easy. Fettuccini, linguini or even small penne would work but I have decided to try something new, like perciati that I bought in Italian supermarket few months ago but never found a recipe to go with them. 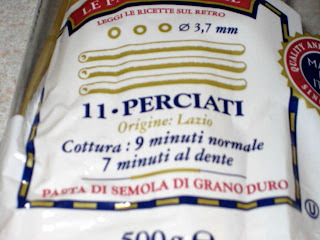 Perciati is a hollow long pasta, sort of like a thick spaghetti tube. When dry the hole is very small but once cooked it triples in size. The texture is fantastic. The problem is that only place you can buy it, I think, is in Italian delicatessen or market. 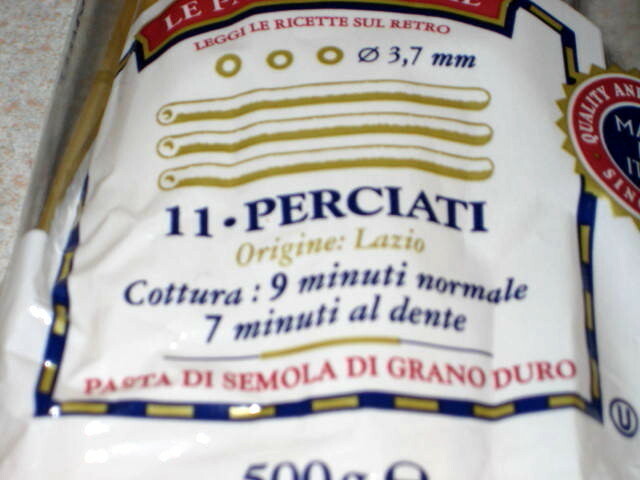 Cook pasta according to instruction on package and keep warm. Toss chicken with little bit of olive oil, salt and pepper. Heat up non-stick frying pan with 1 tsp. of olive oil and cook chicken for 1 minute on each side. Remove chicken to preheated bowl, cover and keep warm. Sauté onions for 2 minutes, add celery and mushrooms, mix and cook undisturbed for about 3 minutes or till mushrooms start releasing their juices. Flip mushrooms over and cook another 3 minutes. Add wine and reduce until there is just a coating on bottom of frying pan. Reduce heat to medium high and stir in cream. When cream starts to thicken return chicken to frying pan and reheat. 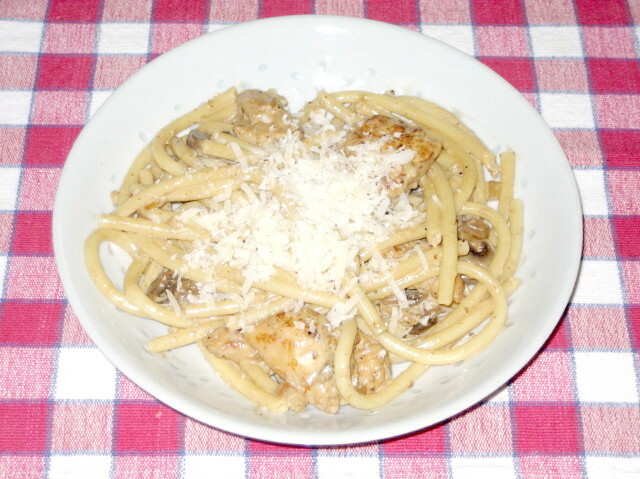 Return pasta to frying pan, toss to reheat and serve on preheated serving plate or bowl and topped with freshly grated Parmigiano Regiano on top. 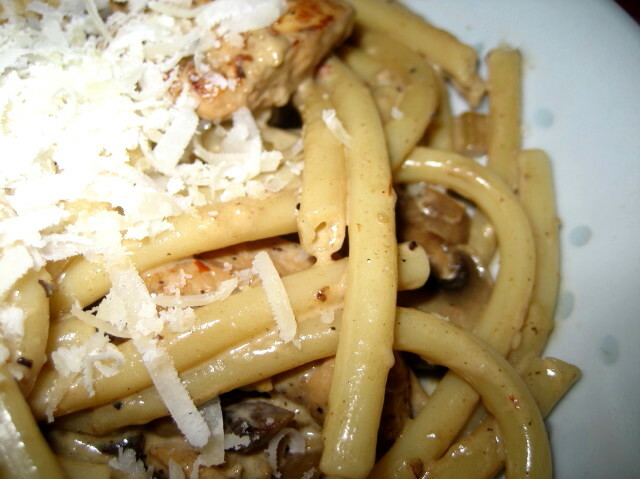 Note: CHOW.com posted video on new way to cook pasta. It is incredibly simple and it works! Check my post on this method.